A wedding themed pokie game may not excite everybody but you have to give credit where credit is due. 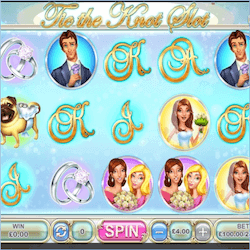 Developer Geco Gaming has taken the wedding theme and fully explored every element of it to make Tie The Knot an exciting and excellently designed pokie. This mobile and desktop compatible pokie takes place at a wedding where everything that can go wrong does. Missing speeches and missing rings appear to be the order of the day here. This slot in many ways can be seen as the sequel to Geco’s January release, Bridal Mischief which could have been the bride’s hen party. This pokie manages to tick every box with regard to features, music, graphics and proper implementation of the theme, but where it does disappoint a bit is with its low 94% RTP and the low jackpot prize which stands at 31250. That said with such fun game play elements it is hard to fault Tie The Knot. If you can look past the saccharine theme there is a lot of pokie fun to be had here and maybe even a few tears if you are an old softie. One of the most exciting bonus features in Tie The Knot is the Get The Rings feature. For some reason the couple here decided to make their Pug their ring bearer. Naturally he runs away with the rings at the crucial moment and one of your wedding guests has to try and stop him and retrieve the rings. This is a pick me bonus game where you must pick one of 4 guests running after the pug. If your picked guest catches Buster, you get win multipliers added to your reel. Toss the Bouquet is a special expanding wild feature which activates randomly in the standard game. The bride will appear and toss her flowers onto the reels, where it lands on the 2nd reel and turns it completely wild. Three of the dove icons will trigger the main bonus feature in Tie The Knot. It is made up of three parts and starts with the Get The Ring feature. After this feature is complete you will move onto the Missing Speech feature. This is another pick me game where you must look through a room to find your best man’s missing speech. Then finally we come to the Wedding Gift feature which is another pick me game. This time you open up gifts and get cash rewards. Tie The Knot is a pokie that Geco can be proud of. Its theme won’t appeal to everyone, but it is great fun to play.